It’s sensuous, it’s earthy, it’s a pleasure- and that’s just this book’s textured cover flap and rich paper. But the contents of the book only got richer and more rewarding as I went on voyage with John Terpstra in his Skin Boat. Curragh and coracle were physical and spiritual skin boats for the 4th century Irish monks who spread the gospel throughout the modern United Kingdom & Ireland. The wind that filled the sail of the solitary sailor’s coracle or a group’s curragh was received as the Spirit’s direction for travel and mission. Terpstra takes this sailing metaphor into a deep, sometimes dark voyage into the reality of our common struggle with that which we experience as church. He’s gentle, brutal, honest, reflective but loving in his reflections about being in the mess of church life. Two friends of mine read it – him, a somewhat agnostic former evangelical and her, a thoughtful committed church person. Unable to explore their different faith voyages, their marriage had a quiet hole in it. 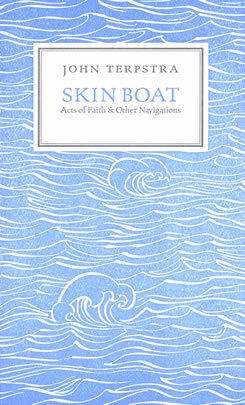 Until they both read Skin Boat and found a bridge for communication about what they truly felt about faith and life. The highest praise I can offer for this book is that it is a bridge to communication. Beautifully written as a contemplative exploration of a similar conflict in his own marriage, Terpstra sails us into unexpected discoveries of grace and light in the darkness and uncertainty of life. Terpstra is funny, blunt, but always humble as one who learns and listens carefully to the tides and storms of life. Skin Boat is a rich reflection of hope that leaves the reader challenged to sail courageously and honestly in one’s own faith context – but always with grace and love.